The rules over long-distance transportation of horses in Europe do not reflect current scientific evidence which shows that horse health and welfare deteriorate on long journeys, a leading international charity says. While the number of horses transported over long distances has dropped, World Horse Welfare is lobbying the UK government to join many other European countries in calling for a review of the Animal Transport Regulation, under which livestock, including horses, destined for slaughter are transported live for days on end with little food, water or rest. A horse being unloaded at a control post. Several European member states including Germany, the Netherlands, Sweden and Denmark publicly support a change to the Transport Regulation (1/2005) which governs these long-distance journeys — but the UK has not yet given its support and World Horse Welfare believes it should whilst it still remains in the EU. World Horse Welfare Chief Executive Roly Owers said now was the time for supporters and all those who care about horses to put their emotion into action and write to the Government now, while they can still make a real difference. “While the UK can still influence laws in Europe that affect the welfare of millions of animals including tens of thousands of horses, it should use this opportunity to live up to its values and call for changes to this outdated legislation,” Owers said. A revision of the transport regulation could reduce maximum journey times and aim to improve the quality of transport for animals going to slaughter. Supporters are urged to take a stand over the issue. 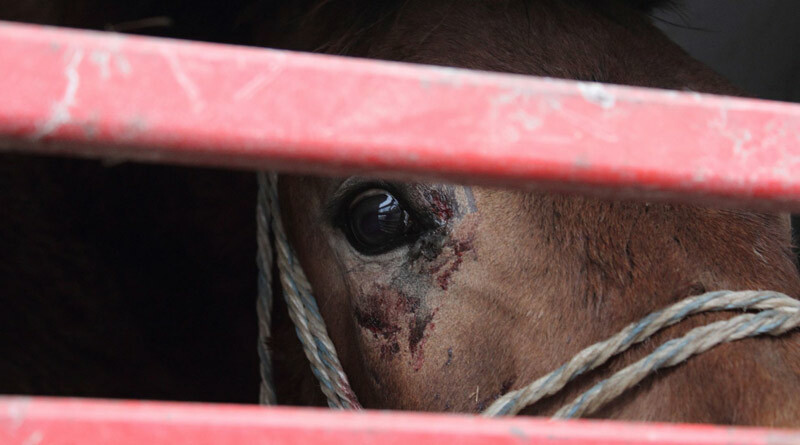 Horses being transported to slaughter.